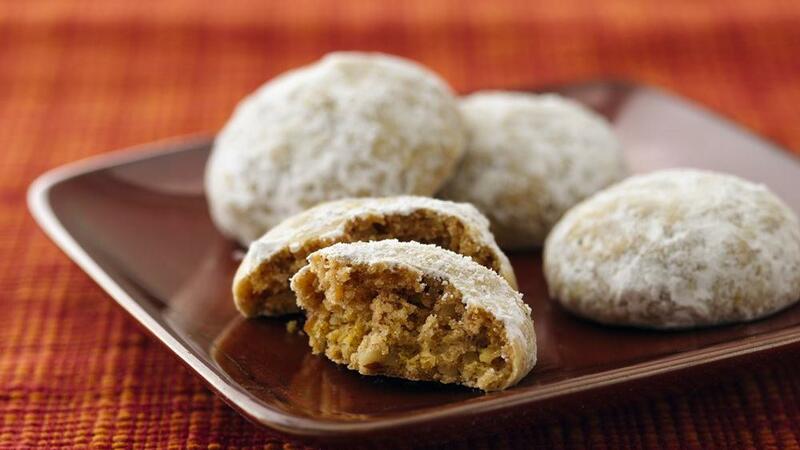 These Pumpkin Spice Snowballs are a new version of your favorite holiday cookie! Adding warm pumpkin spices to Russian Teacakes makes them perfect for fall and holiday baking! Mix butter, 1/2 cup powdered sugar, and vanilla with an electric mixer until fluffy. Add flour, salt, 1 teaspoon cinnamon, ginger, and allspice and mix until the dough comes together. Stir in the nuts. If dough is too soft, chill it until you can work it easily with your hands. Bake cookies for 7-8 minutes until bottoms are just slightly brown. Remove from oven and cool for just a few minutes, until you can handle them. Fill a small bowl with the remaining 1 cup powdered sugar and 1 teaspoon cinnamon and roll each cookie in the sugar until coated. Place on a rack to cool. (Once cookies are cooled, you may want to re-roll them in more powdered sugar.) The added cinnamon in the rolling mixture is optional, but it amps up the fall flavor! Use real butter for best results. Do not substitute margarine or butter spread. Do not overmeasure the flour! Use a spoon to fill the measuring cup, do not pack it. If you only have pumpkin pie spice, omit the cinnamon, ginger, allspice, and nutmeg in the recipe and use 1 teaspoon pumpkin pie spice. Still use the cinnamon in the rolling mixture.